Shi'a Islam or Shi`ism (from the Arabic word شيعة, Persian: شیعه) is the second largest school within Islam. Shi'a Muslims adhere to the teachings of the Islamic prophet Muhammad and his Ahlul Bayt (family). Shi'as believe that the Imam – their preferred title for the political and religious leader of the Muslim community must belong to the direct lineage of Muhammad through his daughter Fatima and her husband (and Muhammad's cousin), Ali ibn Abi Talib (Imam Ali, the fourth caliph). The Imam is regarded as sinless and infallible and appoints his successor (except within the Zaydi sub-group, in which he emerges). The Shi'as reject the first three caliphs in Sunni Islam as usurpers of Ali's Imamate. The theme of lineage and infallibility of the Imam developed within Shi'a Islam, as well as the idea of a hidden Imam who will bring God's judgment in the Last Days. There are several sub-divisions. Some Shi’a, such as the Aga Khan Ismailis recognize a living Imam. For the majority group, the Imam is now "hidden" but will return as the Mahdi. Relations between 'Shi'a and Sunni Muslims have been strained although efforts at reconciliation have also been made. The differences between the two schools can be maximized or minimized, depending on the agenda of the commentator. Shi'a have often lived as minorities and as such have experienced persecution. 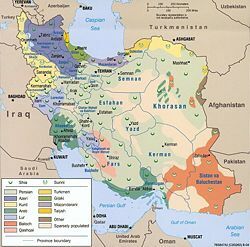 Since the beginning of the Safavid Dynasty it has been the State religion in Iran, where this status has often led to confusion between religion and the pursuit of Iranian national goals, which have sometimes involved a desire to restore Persia's ancient power and prestige in the region. The term Shi'a comes from the Arabic word شيعة Shi'a. The singular/adjective form of this name is Arabic shi`i شيعي. "Shi'a" is the short form of the historic phrase shi`at `Ali شيعة علي, meaning "the advocates of Ali." Sunni and Shi'a sources trace the term to Muhammad himself. The phrase Shi'a of Ali was historically a title given by Muhammad and later by his descendants in praise of Ali's followers and that of the Ahlul Bayt (house of the Prophet’s family). Rippin (1991) refers to Shi'a as an "alternative vision of Islamic identity" (Rippin 1991, 103-116). Ali was Muhammad's cousin, son-in-law, father of his only descendants and the male head of the Ahlul Bayt (people of the house). He was among the earliest followers of Muhammad as prophet. After Muhammad's passing, Ali claimed succession in religious and political authority, supported by his family and followers. Some accounts suggest that Ali himself held back from asserting his right because he did not want to compromise the unity of the community. Shi'as believe that Muhammad appointed Ali his successor on many occasions and that Ali was the rightful leader of the Muslims after Muhammad's passing; to follow Muhammad's true Sunnah one must support Ali's successorship. Shi'as did not accept the rule of the initial three Sunni caliphs although Ali himself took the oath of allegiance, believing them to be illegitimate as well as inferior to Muhammad's direct descendants. The rest of the Muslim community held no such beliefs and chose to follow what they believed to be Muhammad's guidance for choosing the next successor from within Muhammad's tribe through consultation (shura). This difference between following the Ahlul Bayt (Muhammad's family) and Sahaba (Muhammad's companions) has shaped Shi'a and Sunni views on some of the verses of the Qur'an, on the hadith, on personalities in Islamic history and on certain other issues. Hadith which the Shi'a accept have a high proportion of narrators from the Ahl al-Bayt whereas those accepted by the Sunnis have many narrators who were not of the Ahlul Bayt. Regardless of the dispute about the Caliphate, Shi'as regard the concept of Imamate highly, also called Khalifa Ilahi (divinely chosen successorship to Muhamamd). Aside from textual and opinions on leadership, the general practices and rituals of Shi'as and Sunnis are very similar. Recognition of Ali as Imam is added to the Shahadah (first pillar, the confession of faith), and other minor ritual differences exist. The real schism did not occur until after the tragic death of Hussayn at the Battle of Karbala in 680 C.E.. Development of the concept of the Imam's infallibility and inspiration is generally attributed to the sixth Imam, Jafar ibn Muhammad (703–765), also known as Jafar as Sadiq,, who made a major theological contribution to Shi'a Islam and whose legal knowledge was also recognized by Sunnis. His school is sometimes regarded as a fifth legal school, alongside the four Sunni schools of jurisprudence. Map showing religious (Shia and Sunni) diversity among the population of Iran. One of the lingering problems in estimating the Shi'a population is that unless the Shi'a form a significant minority in a Muslim country, the entire population is often listed as Sunni. The reverse, however, has not been held true, which may contribute to imprecise estimates of the size of each sect. A large portion of the world's Shi'a live in the Middle East. They constitute a majority or a plurality in countries such as in Iran, Iraq, Yemen, Azerbaijan, Lebanon, and Bahrain. The bulk of petroleum deposits in the Middle East are located under Shi'a-inhabited lands (including Iran, Iraq, and Azerbaijan). A vast majority of the populations of Persian Gulf countries (including Iran and Iraq) is also Shi'a. The 1926 rise of the House of Saud in Arabia, brought official discrimination against Shi'a. The Shi'a-majority provinces of Hasa, Qatif and Hufuf on the Persian Gulf, and western Arabia provinces of Jazan, Asir, and Hijaz, that had large Shi'a minorities, have officially been completely stripped of their religious identities. Shi'a endure much bigotry and other indignities from Saudi authorities daily and Shi'a pilgrims from other countries are often singled out for harassment. Turkey, Afghanistan, Saudi Arabia, Pakistan, and India also hold significant Shi'a minorities. Among smaller Persian Gulf states, Qatar, Kuwait, and the United Arab Emirates have significant Shi'a minorities, as do the Eastern Province, Saudi Arabia and other regions of Saudi Arabia. Shi'as are also found in some numbers in southeast Asia, from Vietnam (the Cham people) to Thailand, Philippines, Indonesia, Malaysia, and Brunei. 'Shi'a are commonly cited as 10 percent of all Muslims, although some place their number as high as 20 percent. 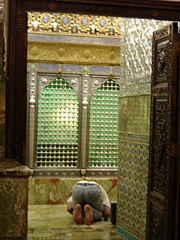 A Shia man in prostration facing Mecca, performing morning prayers inside an Imamzadeh. Imamah (Leadership): God has appointed specific leaders to lead and guide mankind—a prophet appoints a custodian of the religion before his demise. Jihad (Struggle) – struggling to please God. The greater, or internal Jihad is the struggle against the evil within one's soul in every aspect of life. The lesser, or external, Jihad is the struggle against the evil of one's environment in every aspect of life. Shi'a have many other doctrines that are shared with other Muslims, like wearing of the Hijab. However, some are seen as more predominantly used by Shi'as, like "Dissimulation" (Arabic: Taqiyya), which is the dissimulation of one’s religious beliefs when one fears for one's life, the lives of one's family members, or for the preservation of the faith, and temporary marriages (Arabic Nikah Mut'ah). The latter two sometimes are seen as controversial practices. In addition to Id al-Fitra and Id al-Adha, Ashurah, the 10th of Muharram, is commemorated as the day of Hussayn's martydom, often with street processions and symbolic self-flagellation. Sunnis also mark this day but Shi'a do so on a larger scale. Shi'a piety emphasizes suffering and martydom, which are much less prominent themes among Sunni. Sufi Islam crosses both traditions. Many eminent Sufi masters were from Iran, and much Sufi literature is in Persian. The Shi'a of the present day are divided into religious denominations based on their beliefs regarding the sequence and recognized number of the imams. •Most Shi'a are Twelvers—they recognize twelve imams. Muhammad ibn Hasan (868—), also known as Muhammad al Mahdimahdaviat shi'a twelver also called mahdaviun. Twelvers believe the twelfth Imam, the Muhammad al-Mahdi|Mahdi ("the guided one"), has been occluded (in Ghaibah; "hidden away" by God). They believe he is still alive and will return. He is sometimes referred to as the "Hidden Imam." Beliefs vary as to what will happen when he returns. It is generally believed that he will be accompanied by Jesus ("Isa" in the Qur'an) and will affirm Muhammad's message from God to mankind. On his return, perpetual peace and justice will be established. Following the establishment of the Safavid Dynasty in Iran, Twelver 'Shi'a became the official religion. There are three schools of Twelver Shi'a: the Usuli (to which the majority of Twelvers belong) and two minor schools, the Akhbari and the Shaykhi. There are several groups of Ismaili Shi'a, which include Seveners, Dawoodi Bhoras, Alavi Bhoras, and the Nizari Ismailis. Seveners are the second largest group of Shi'a. They accept Jafar as Sadiq's eldest son Ismail as the seventh Imam. They hold the notion that the line of Imams continued on after a period of occultation for Ismail's successor and son in the ninth century through to the present day in the person of the Aga Khan. Since Ismail was rejected by the Shi'a majority at the time, Seveners do not recognize any further of the Twelvers' Imams beyond Jafar. Zaidis generally do not recognize Twelver Imams beyond Ali ibn Husayn and do not believe in the Hidden Imam concept. Zaidis reject the notion of divinely appointed Imams or designated Imam. Zaidis are considered moderate in that they accept a leader with good qualifications to assume leadership of the community provided he is descended from Muhammad. Shi'ism holds that the Imamate is one of the fundamentals of Islam (A part of the Usul-Ad-din) and that one should follow the Imams of Ahlul Bayt, in order to correctly follow the Prophet Muhammad and his Sunnah. The Shi'a believe that the Imams of Ahlul Bayt are infallible, they are the perfect example for mankind, and like the prophets, they should be emulated in acts and deeds. Shi'as believe that the Imams of Ahlul Bayt carry the divinely appointed responsibility of protecting Islam and enacting the example of the pure Sunnah of Muhammad. The Imams of Ahlul Bayt have guided Muslims throughout history, in many cases under the most horrible circumstances and under the most severe forms of discrimination due to the cruel policies of the reigning governments' of the time. They are seen as incorruptible and infallible role models for Muslims that have shown the way of goodness and prosperity in this world and the next in the best way until their martyrdom or occultation. Shi'a Muslims believe that the study of Islamic literature is a continual process, and is necessary for identifying all of God's laws. Unlike Sunni Muslims, Shi'a Muslims believe that they can interpret the Qur'an and the Shi'a traditions with the same authority as their predecessors: that the door to ijtihad was never closed. Since the Imam’s occultation, scholars have had the task of acting as his eyes and ears. Initially, there was disagreement about whether ijtihad could still be exercised between the party known as the Akbari, and the Usuli, with the former opposing continued ijtihad and the latter supporting this as essential within the life of the community. The Usuli school won, and ijtihad remains an important practice. All twelver Shi'a choose a scholar whom they imitate and scholars who attract the largest number of followers rise higher up the ranks of what is often referred to as “clergy.” Only senior scholars can exercise ijtihad, and this tends to be a collective enterprise since the senior scholars represent a type of college, or academy. A very popular jurist may be considered to be the “absolute point of reference” and to have no need to consult others. 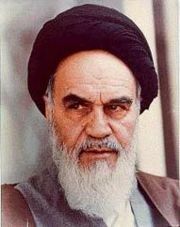 Following the downfall of the hereditary monarchy in Iran in 1979, the government established under Ruhollah Khomeini was rule by the jurist. He contended that “leadership of the ummah devolves upon the just and pious jurist.” Unusually, Khomeini used the title “Imam” and some Iranians may have thought that he was either the Mahdi, or his precursor. Twelvers believe that they should follow, or imitate (taqlid) the example of a living teacher, not of a dead man. While Shi'a and Sunni accept the same sacred text, the Qur'an, they differ somewhat in their approach to recorded oral tradition, or hadith. Shi'a believe that the split between the Shi'a and Sunni began with Muhammad's death, when a small number of Muslims supported the successorship of Ali and the rest accepted Abu Bakr, then Umar and Uthman. They believe that the successorship was given to Ali at Ghadir Khum (a hadith accepted by both Sunni and Shi'a scholars), and that the testimony that can be traced back to reliable sources is to be trusted, while traditions that cannot be fully verified are suspect. Sunni generally accept the hadith collections of Bukhari and Sahih Muslim as sahih (trustworthy), and only accept hadiths from these books if they are consistent with their own collections or that can be reliably verified through ijtihad (independent interpretation of legal sources). It is reported that Ali remembered that hadith in the Battle of Siffin against Muawiyah, the first Umayyad caliph, when a huge faction deserted his troops called Kharijites declaring that he has compromised his piety by agreeing to human arbitration. He divided his troops and ordered them to catch the dissenters before they could reach major cities and disperse. Since Islamic law is based on the hadith, Shia rejection of some Sunni hadith and Sunni rejection of some Shia hadith, means that their versions of the law differ somewhat. For example, while both Shi'a and Sunni pray Friday (Jum'a) prayers, prayer times differ, their prayer times differ for there is no set time for Asr and Ishaa prayers (disputed amongst various Sunni schools of thought as well). Some Shi'a also practice temporary marriages, or mut'a which can be contracted for months or even days (Mut'a was practiced by Sunni until outlawed by Omar, the Second Caliph), and follow different inheritance laws. The Ja'fari Shi'ites consider Sunnah to be the oral traditions of Muhammad and the Imams. Al-Kafi by Kolayni, in Tabatabai's words is "the most trustworthy and celebrated work of hadith in the Shi'ite world, and it has near to 4,000 authentic hadith from a total of 16,000 hadith according to Ayatollah Sayed Ali al-Sistani. Eid ul-Adha, which marks the end of the Hajj or pilgrimage to Makkah, starts on the tenth day of Dhul Hijja. The Festival of Muharram and Ashurah (عاشوراء) for Shi'a commemorates Imam Husayn bin Ali's martyrdom. It is a day of deep mourning. Sunnis do not ascribe religious significance to Hussayn's martyrdom, but for them this is a day of voluntary fasting with a day either preceding it or following it, in remembrance of the salvation of Moses and his followers (the Jewish people) from the Pharaoh and his army. Ashurah occurs on the tenth of Muharram. Arba'een commemorates the suffering of the women and children of Imam Husayn's household. After Husayn was killed, they were marched over the desert, from Karbala (central Iraq) to Shaam (Damascus, Syria). Many children died of thirst and exposure along the route. Arba'een occurs on the twentieth of Safar, 40 days after Ashurah. Milad al-Nabi, Muhammad's birth date, is celebrated by Shi'a on the seventeenth of Rabbi al-Awwal, which coincides with the birth date of the sixth imam, Ja'far al-Sadiq. Sunnis consider Muhammad's birth date to be the twelfth of Rabbi al-Awwal but many Sunnis do not consider this day religiously significant. Mid of Shaban is the birth date of the twelfth and final imam, Muhammad al-Mahdi. It is celebrated by Twelvers on the fifteenth of Shaban. Many Shi'a fast on this day to show gratitude. Eid al-Ghadeer celebrates Ghadir Khum, the occasion when Shi'a believe Muhammad announced Ali's imamate before a multitude of Muslims. Eid al-Ghadeer is held on the eighteenth of Dhil-Hijjah. Al-Mubahila celebrates a meeting between the household of Muhammad and a Christian deputation from Najran. Al-Mubahila is held on the twenty-fourth of Dhil-Hijjah. Shi'a and Sunni historians record that many Shi'as have been persecuted, intimidated, and killed, through what Shi'a consider a coup d'état against Ali's caliphate. In the past, some Sunni scholars (belonging to the Salafi tendency) are known to have openly considered the Shi'a as "Kafir" (disbelievers). Writing by Sunnis about Shi'a and about Shi'a by Sunnis has often had a polemical aspect. As Rippin (1991) points out, a "tradtion ascribed to Muhammad ... speaks of his community dividing into 73 ... parts" of which "only one ... will actually be saved" and so writers have set out to demonstrate why their group is the one that will enter Paradise (Rippin 1991, 104). However, many Sunni scholars of recent history have become more tolerant towards Shi'a Muslims and some have promoted unity, others have not. Yet within Shiism, it has always been stressed to seek unity among the majority. Organizations such as the Shi'a Lebanese Hezbollah have increased popularity of Shi'a among Sunnis and are seen as a credible organization and in many cases praised by both ideological parties. "The Shi'a is a school of thought that is religiously correct to follow in worship as are other Sunni schools of thought." Today, both Shi'a and Sunni students graduate and study at the Al-Azhar university. Eminent Shi'a scholars such as S. H Nasr wrote for all Muslims. Stressing unity, they do do not pursue a partisan agenda. Many Sunni were inspired by the Islamic revolution in Iran, which they saw as an example of what can be achieved by a popular, non-violent uprising against what in their view are illegitimate governments. Qom, Najaf, Mashad, Ray, Tabriz, Isfahan, Tehran, Sur (Lebanon), Saida, Jabal Amil Hawzah (Lebanon), Halab, Damascus, Qatif, Kufa, Samarra, Karbala, al-Mada'in (Iraq), Hillah, Lucknow. Mafatih al-janan; a collection of prayers. This page was last modified on 14 September 2015, at 16:13.